Upcoming book presentations of Trading Places: Practices of Public Participation in Art and Design Research. 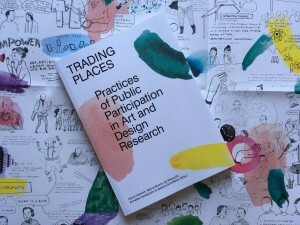 In September we launched the book Trading Places: Practices of Public Participation in Art and Design Research. The book is one of the results of an intense collaboration among the six TRADERS partner institutions: Design Academy Eindhoven, Chalmers, Royal College of Art, KU Leuven, HDK Academy of Design and Crafts, and LUCA School of Arts. But the book has contributions that go beyond the borders of our TRADERS consortium. The following people have made a contribution to the book: Sophia Krzys Accord, Henric Benesch, Ethel Baraona Pohl, Naomi Bueno de Mesquita, Pablo Calderon Salazar, Reem Charif, Catharina Dyrssen, Adrian Friend, Jon Geib, Saba Golchehr, Mohamad Hafeda, Susannah Hagan, David Hamers, Hilde Heynen, Liesbeth Huybrechts, Michael Kaethler, Ida Elisabet Liffner, Ruth Mateus-Berr, Chris Perkins, Anne van Oppen, César Reyes Najera, Meike Schalk, Jessica Schoffelen, Diana Tanase, Veerle Van der Sluys, Annelies Vaneycken. There will be book presentations during LUCA Showcase (October 23-27, in Ghent, Belgium), Dutch Design Week (October 21-29, in Eindhoven, Netherlands) and HDK’s Open Week (November 20-27, in Gothenburg, Sweden). Similar book presentations will be organized in our partner institutions. So keep an eye out on our facebook page for updates. The book can be purchased online, in paperback or as a digital copy. Trading Places rethinks, develops, and tests design-driven practices and methods to engage with participation in public space and public issues. With this book we aim to help art and design researchers, st udents, practitioners, and the multiple stakeholders they collaborate with, to explore what participatory ways of working in our contemporary urban environment entail. Six approaches are discussed: intervention, performative mapping, play, data mining, modelling in dialogue, and curating. Each approach offers a different kind of logic and produces a different type of knowledge. Trading Places invites the reader to discover common ground, explore new territories, and exchange points of view – in short, to trade perspectives on issues of participation. TRADERS allows to bundle the strength of disciplines such as art, design, architecture, and urbanism to commonly approach and challenge other disciplines and sectors. TRADERS opens up the debate about the roles that art and design research can play in engaging people in public space and public issues.